These two concertos both have much to commend them, but they also have one very big problem – a complete lack of originality. Julius Röntgen was obviously very keen on Beethoven, Schumann, Bruckner, Wagner, Verdi, and above all Brahms. Given the premium status afforded to originality in the Romantic era, Röntgen's willingness to just rip off these composers for tunes and harmonic progressions is surprising, and it is tempting to listen to this disc as just a string of homages/ripoffs of the great German composers of the 19th century. But that's only fun for a couple of minutes, and a much better way to approach this music is to listen in for its own considerable merits. Röntgen's loyalty to Brahms wasn't unusual among composers of his generation, and like them he added something of himself to his thinly veiled imitations. If, like me, you find Brahms' piano concertos a bit heavy, the levity of Röntgen's versions is very welcome. His music isn't based on the same sense of tight symphonic argument. Instead, it usually takes a more laid back and free flowing melodic approach. That often brings him closer to Schumann's concerto, another work that he comes dangerously close to plagiarising wholesale. And the technical skill in Röntgen's writing, both for the piano and the orchestra, is undeniable. In the 2nd Concerto he often gives melodies or obbligatos to solo woodwind instruments, and the way that these lines match the timbres of the instruments is very finely judged. I find the slow movements of the two concertos the most satisfying, especially that of the Fourth. Ok, so the movement starts off sounding just like the second movement of Bruckner 7, but it then evolves into something surprisingly individual and heartfelt. And emotion is something all of this music has in spades. The piano writing in particular is always in the grand heart-on-sleeve Romantic tradition. 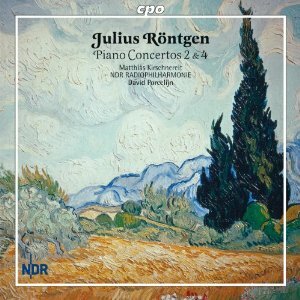 Like all of Röntgen's works, these concertos have suffered more neglect than they deserve. The derivative nature of the musical prose may be partly to blame, but the sheer difficulties of the solo part must also be a factor. The outer movements of the Fourth Concerto in particular make the kind of demands that you will only find in the most complex of Romantic concertos. Credit then to Matthias Kirschnereit, who plays everything with grace and panache. He puts in quite a lot of rubato, but no more than the music itself suggests. The clarity of his touch is a real asset. Röntgen's piano writing, difficult as it is, doesn't really need help in terms of clarity from the player. Even so, this expressive yet clear sighted reading is exactly what is needed to do the music justice. The NDR Radiophilharmonie Hannover are sympathetic accompanists, and conductor David Porcelijn follows the contours of Kirschnereit's phrasing with pinpoint precision. The recording quality is excellent, with a lively sound from the piano, clearly delineated sections in the orchestra and a perfectly judged balance between the two. An interesting addition then to the CPO's Röntgen Edition, but one that highlights his failings as much as his qualities. It's well worth hearing, just as long as you're not expecting anything radical or new.